Mr. R. F. Goodlett secured enough funds and The Comos was built in 1912. The Comos, as the Lyric Theatre was originally named, was designed as a vaudeville theater and included space for several commercial offices. 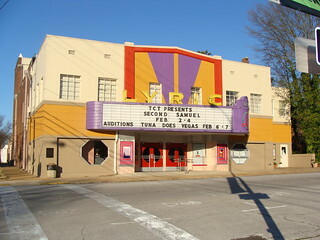 The Lyric remained a home for live productions until the 1930's, when it became a part of the M.A. Lightman Company (Malco) chain of movie houses, acquiring its now-familiar marquee and Art Deco appearance. A persistent rumor dictates Elvis’ first kiss was stolen in the balcony of the Lyric. However, the theater's sturdy brick walls were truly tested on April 5, 1936. A massive tornado swept through, leveling much of the city. Being one of two buildings to survive this meteorological event, the Lyric was turned in to a makeshift hospital and mortuary. The dead and the dying were moved in to the building. Surgeries were performed, using the popcorn poppers to sterilize medical instruments and crawl spaces temporarily stored the dead. An estimated 216 people were killed and another 700 injured. The official numbers may have been higher due to racial discrimination involving newspapers. It's believed one of those victims may have stuck around. Theater staff named their ghost "Antoine" and accuse him of such minor offenses as stealing keys and humming to himself. He clomps around the theater in the wee hours, moving things around. By 1984, the Lyric had outlived its usefulness as a movie theater and was facing likely abandonment and demolition. The Tupelo Community Theatre snatched the Lyric away from the wrecker’s ball in the fall of 1984, and began work on renovations. With gifts and pledges that eventually totaled over $230,000, the Theatre’s friends rebuilt the stage, installed new theatrical lighting and sound systems, totally rewired the building, installed a new heating and air conditioning system, and, most visibly, spectacularly restored the lobby. The Lyric Theatre is still in use to this day.